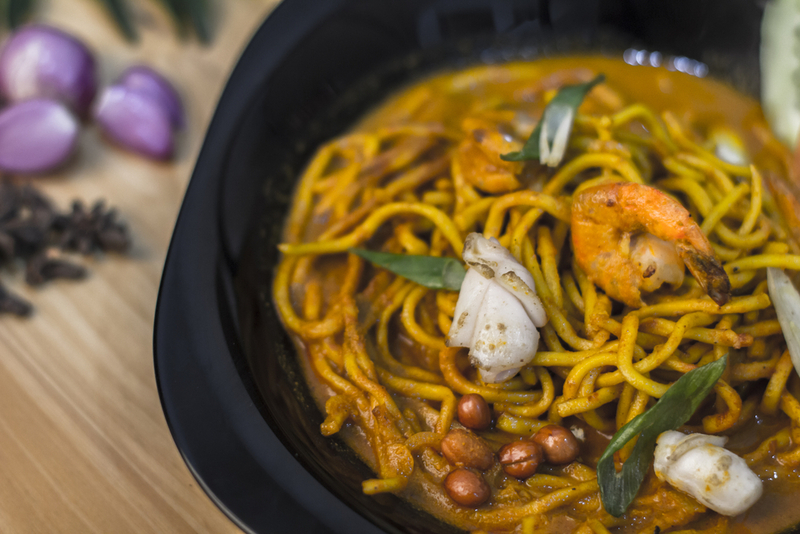 Aside from white rice, mie or noodle is another staple for Indonesians. It can be eaten for breakfast, lunch, dinner, or even as midnight snack. There are many types of noodles in Indonesia—almost each region in Indonesia has its own version of noodle menu. 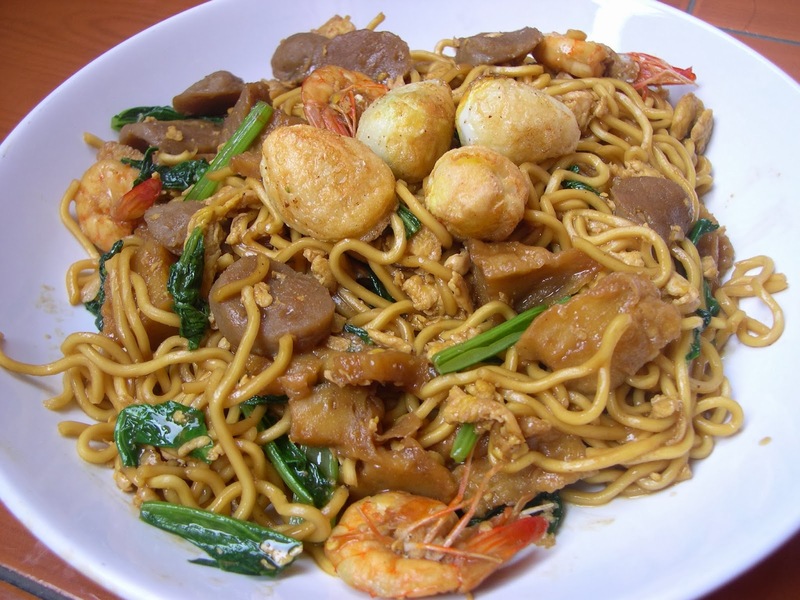 For example, Aceh has Mie Aceh, South Sulawesi has Mie Titi, or Java with its Mie Goreng Jawa. 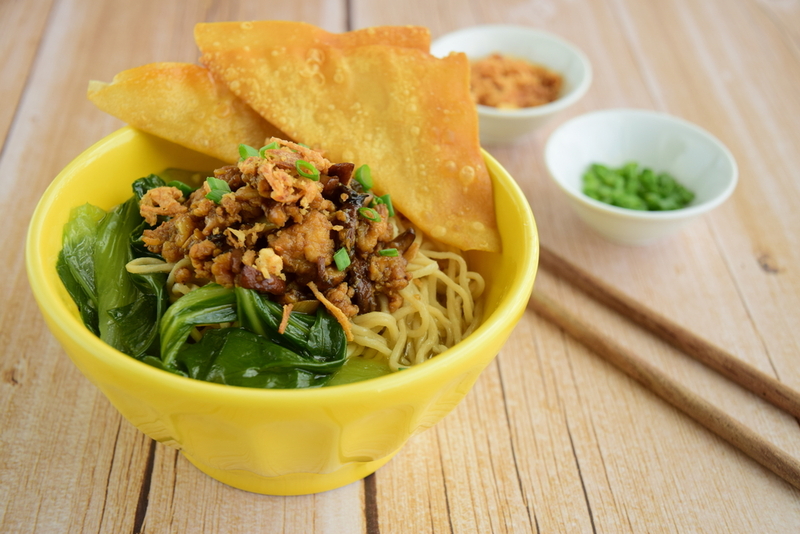 Among the many varieties of noodle, there is one common type of noodle that you can find across Indonesia: Bakmi. Bakmi is a wheat based noodle which was brought to Southeast Asia by Chinese immigrants with Fujian or Hokkien origin, generally prepared and topped with minced pork seasoned in soy sauce and a few sliced char siu (barbecued pork), with addition of Chinese green vegetables and a bowl of savory broth. Today, the dish has also been further developed to more closely align with the local tastes. In Indonesia, due to the large Muslim population, other topping choices like chicken, mushrooms, and beef are used. Other additional condiments like boiled and fried wonton skins are also normally added in one portion of Bakmi. Bakmi is normally boiled for serving. When Bakmi is intended for use in soup, it is usually boiled separately from the broth. The noodle is then served with toppings and soup served in a different bowl. The soup is added to the noodles by the individual diner according to taste. Some boiled Bakmi are also served with thick gravy instead of soup, or stir fried. The stir fried process follows after boiling the Bakmi, it is stir-fried with vegetables, sweet soy sauce, meat, eggs, or any other ingredients and spices. However, there are exceptions such as Ifu Mie, which is deep fried Bakmi and topped with vegetables, meat, and gravy. Bakmi is literally omnipresent in Indonesia with various names. Some regions in Indonesia call Bakmi as “Mie Ayam”, “Mie Bakso”, “Mie Yamin” or just “Mie”. These menus are everywhere, in restaurants, 5-star hotels, and of course, street food vendors. This is the basic Bakmi recipe (only the noodle). In a big bowl, mix together two types of flours and salt. Empty the middle part of the mixture. 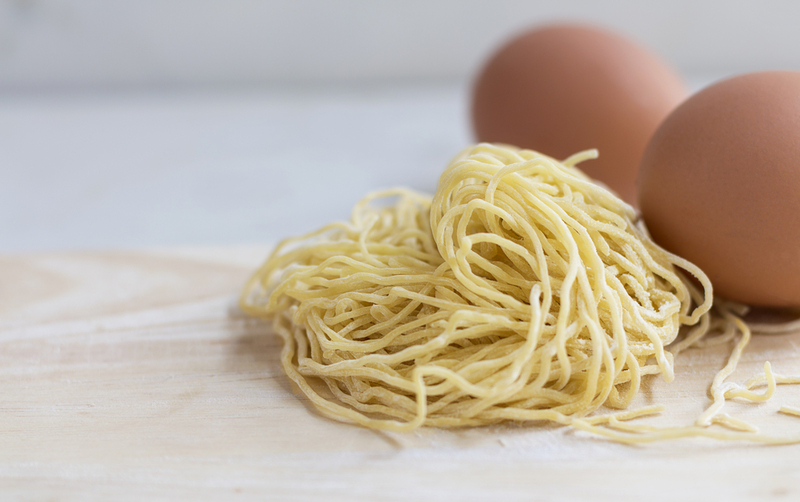 Put eggs on the hole, mix and knead the dough until it’s not sticky anymore. Divide the dough into four parts. Sprinkle the dough with wheat flour. Thin the dough using rolling pin. Process the thinned dough using pasta maker. The common thickness for Bakmi is 1-2 mm. Continue processing to cut the dough into thin noodle form. Boil water in a deep pan/pot, add a teaspoon of salt and oil. Add the noodle and boil until it reaches desired texture/softness. Remove from the heat, drain the noodle and it’s ready to be prepared. And below is one of the most common types of Bakmi you can find in Indonesia: Bakmi Ayam Jamur. In this recipe you will need to prepare the noodle (see the recipe above), Stir Fry Chicken Mushroom, and chicken broth. You may also add meatballs and fried wonton skin as condiments. Additional sauces like ketchup, sweet soy sauce, and Sambal can be also added to taste. In a bowl, combine 1 tablespoon mushroom soy sauce, chicken cubes and ground white pepper. Add 1 tablespoon tapioca starch and mix well. Set aside. Heat one tablespoon of cooking oil in a pan. Stir fry garlic and ginger until fragrant. Add seasoned chicken, stir frequently until the chicken changes color and fragrant. Add mushrooms, mushroom soy sauce, sweet soy sauce, broth/water, salt and pepper. Cook until chicken is cooked and the seasoning is absorbed to the meat. Leave on a small amount of broth in the cooking for assembling the noodles later on. Boil water in a large pan. Add all chicken broth ingredients and cook at high heat. Once it’s boiled, reduce to low heat and continue cooking until the next half an hour. Remove from the heat, drain and broth is ready to use. Prepare one bowl for the noodle and another smaller bowl for the soup. In a big bowl, combine 2.5 tablespoon chicken oil (from the stir fry chicken and mushroom), 2.5 tablespoon light soy sauce, and a dash of ground white pepper. Add one portion of boiled noodle, mix well. 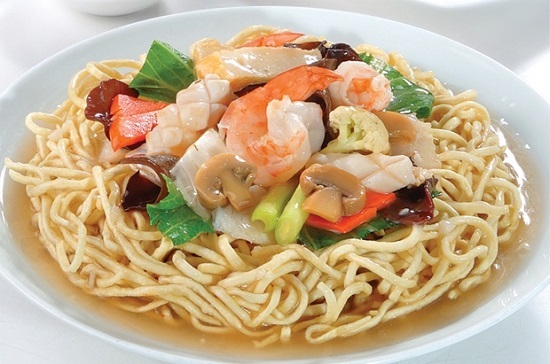 Top the noodle with boiled Chinese mustard, bean sprout, and stir fry chicken mushroom. Add other condiments (wonton skin, meatball, and fried shallot), and Bakmi Ayam Jamur is ready to serve.